It was a chilly Sunday morning and once again, for some reason, I decided to punish myself by signing up for this race. This is one of those races where you really don't know how hard it is unless you actually try it. The Bear Mountain course is a measured 10k course on pavement. It follows the complete golf cart path around the 18 hole golf course. The path is about 5 feet wide, and has curbs on either side. However, it is the elevation that makes this course difficult. No part of the 10k course is flat. It is a 10k continuous hill training run, with no rest. I had run this race the year before. I ran well, by my standard, and came in at 44:16. I finished in 27th place, out of about 150. It was for this reason, I felt excited and concerned. I was excited because this would mark the first time that I would actually be able to compare my speed now versus last year. I felt like I was faster, but who really knew. I was concerned, however, that becasue I ran pretty well last year, that I had to go even harder this year. To make matters worse, I really hadn't been training much the 2 weeks prior to the race. I think the week of the race, I had only logged like 20 km. This is brutal, by anyone's standard. I got to the race in ample time. Janelle and Teagan came to watch my race and cheer me on. Fantastic. The weather was clear, but cold. I didn't see any sign of frost on the course, but it must have been close to frost. I walked over to the hotel and picked up my race pack. I could tell right away that there were far more competitors than the previous year, and there were way more hot-shot runners as well. Olympians, national team members, running shoe store owners...they were all there, and I knew most of 'em. What a difference a year makes. I actually feel like I am one of the running circuit members now. After a pretty good warm-up, I started the race very well. My plan going into the race was to start slow and try not to be too excited. This is actually always my goal, but rarely takes place. However, this day would be different. After the first kilometre, I found myself in a small pack of about 4 people. I knew these four people were sub-40 runners, so I felt alright with where I was. Then it was time for the Papa Bear hill. This daddy-of-a-hill is close to 2 km in length, and the hill is simply deadly. Anyone who does not know the course eventually walks up it, because they would not know that it goes up forever. I did well up the hill. It was difficult, but I still remained in the same small pack. Now it was time for some downhill running. Perhaps the weakest part of my running is my downhill ability to fly down the hills. In my younger days, I would tear down the hills...but now, I just tried to keep good form running down them. I had actually practiced alot of downhill running technique over the past couple of months, so one of my goals was to focus on my angle going down the hills. Overall, I seemed to do well, but the pack slowly left me. At about the 5.5 km mark, we rounded the water station corner and I saw Janelle and Teagan cheer for me. Teagan was yelling "Go daddy, go!". The spectators around her smiled and thought how cute it was. After the corner, I struggled. The hills were relentless, and the next 1.5 km were pretty much up. Included in this section was the Mama Bear Hill, which is shorter in distance than the Papa Bear one, but much steeper. I actually walked up this hill last year in the race, so when I slugged up it, I was proud of myself. I saw the 7 km mark. All was good. The majority of the course was now downhill, so making it in decent time was definitely going to happen. However, downhill meant people passing me. A young Asain guy flew by me on the downhill. 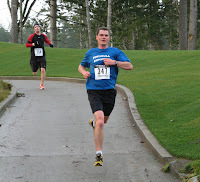 Soon thereafter, Rob Reid passed me on another downhill. Damn. This sucked. I wanted to beat him badly. One of my goals was to beat him. But he is simply too good of a runner. After all, he doesnt own Frontrunners for nothing! I was still holding a good pace. As I rounded the 9 km marker, I saw Janelle and Teagan one final time. I wasn't smiling so much this time though. I knew one final hill was coming up. I remembered this from last year. This hill surprised me last year, because the common thought at this point of the race is just to hammer to the finish line. Not this time. I held my pace and prepared myself for the Baby Bear Hill. I kept a pretty good pace through it, and one I hit the top, it was over. A flying downhill finish to the hotel was all that was left. 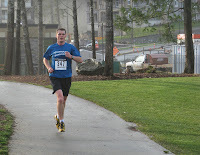 I now hammered up my pace and gave the crowd something to cheer about, as I flew it right at 42:00. Wow. Definitely exciting. I accomplished so many goals with this run. 3) I ran the downhills much better. 4) I beat Nancy Fedoruk. Overall, I came in 20th place. Sweet showing for me. 251 entries. I wonder if I can improve next year? We were proud of you Baby! It was a great race to watch (4 places to cheer you on throughout the race). It is fun to read your blogs. Keep it up!